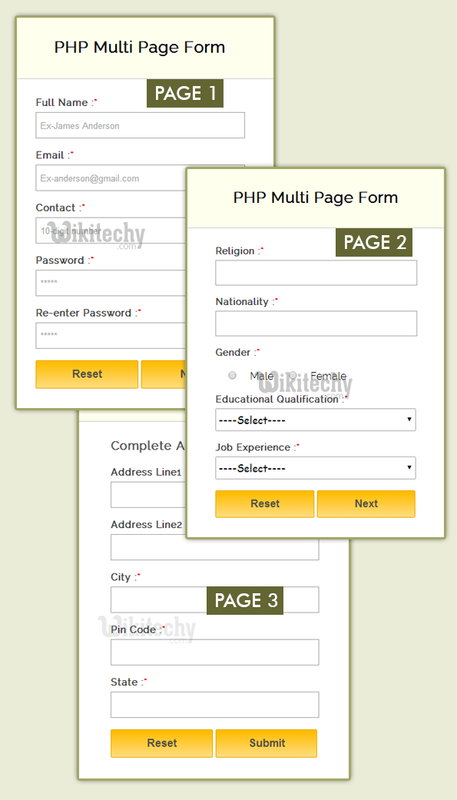 A multi page form in PHP can be created using sessions, that are used to retain values of a form and can transfer them from one page to another . PHP sessions to store page wise form field values in three steps. Also, we have applied some validations on each page. At the end, we collects values from all forms and store them in a database. Watch our live demo or download our codes to use it. Our complete HTML and PHP codes are given below. Given below are the codes for first part of the form, as user fills it and clicks on next button, it will redirect to second page . session_start(); // Session starts here. In the below script, we validate all fields of page1 and set sessions for page1 errors. // Checking first page values for empty,If it finds any blank field then redirected to first page. // Sanitizing email field to remove unwanted characters. // After sanitization Validation is performed. // Validating Contact Field using regex. // To show error of page 2. In the below script, we validate all fields of page2 and set sessions for page2 errors. // Checking second page values for empty, If it finds any blank field then redirected to second page. $_SESSION['error_page2'] = "Mandatory field(s) are missing, Please fill it again"; // Setting error message. header("location: page2_form.php"); // Redirecting to second page. // Fetching all values posted from second page and storing it in variable. header("location: page1_form.php");// Redirecting to first page. Here, we collects values of all pages and store them in database. // Setting error for page 3.
header("location: page3_form.php"); // Redirecting to third page. extract($_SESSION['post']); // Function to extract array. $db = mysql_select_db("phpmultipage", $connection); // Storing values in database. header("location: page1_form.php"); // Redirecting to first page. To create table in MySQL Database.